I have a g35x all wheel drive infinty. I recently got into an accident. I T-Boned another vehicle hitting the person dead on, in the middle of the bumper. Causing a cracked bumper, and aligmen issues. I was working out of town at the time so didnt take it in to get repaired right away, which might have lead to these other issues. My front and rear aligment was out. I went through 2 rear tires in the matter or a couple weeks, becuase they where wearing on the inside of the tires, but fine out the outside. almost like both tires are at in 5 degree angle to the inside causing all the tread wear. (my friend put it onto a lift, it see if anything was lose, and when i shook the rear tires, they where solid). I took it to get fixed, but the insurance company said it was to minor of an accident to cause aligment issues. So i paid for the front end to get fixed for the time being. Now that winter is here, anytime i drive it when i am off work, and i hit, snow or slick area's my rear end sways side to side/slips out. 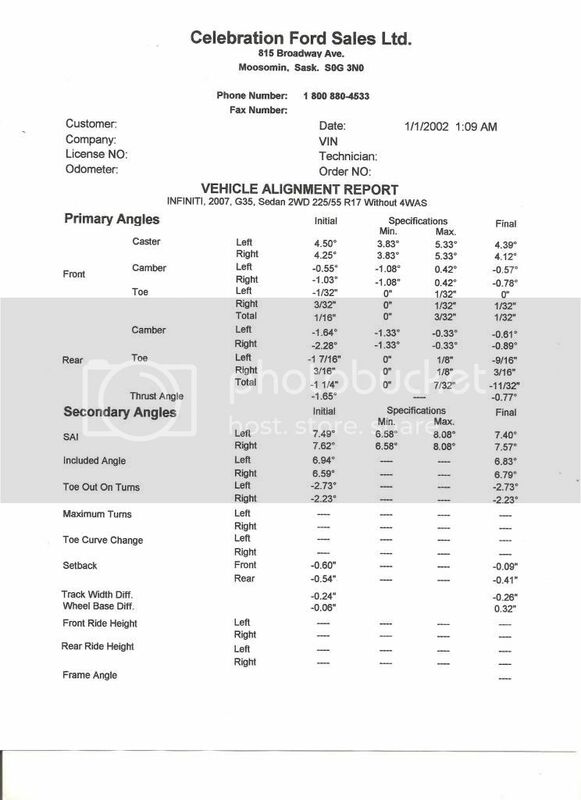 Sounds like the rear tracking may be off......Do you have a printout of the alignment specs you could post???? If you get into a slick area you can feel it because with less traction its easier to pull it back into line athnd it can do it faster......almost like the rear is "surging"
I do not have that spec, (tho i just emailed them asking for print-out), but this is what the invoice states. "preform a four wheel alingment"
attempting to adjust however there is not enough movement fr the required change needed to correct aligment. rear tires have noth got inner wear (cords showing). These kits, is this something if i take it to a garage they will take care of, and if this is what is wrong, with labour (guestimating) how much do you think they will bend me over for this, when it is all said and done? 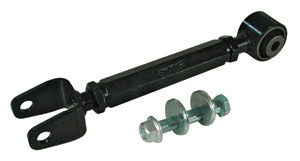 These kits are designed to give a tech more adjustment when a factory adjustment is maxed due to a frame settling over time or ride height sinking to a minimum range or there isn't a factory adjustment for the angle in question. Did you have a chance to check our your tires to see if there is any kind of wear going on???? rear frame damage, rear suspension damage, or a combination of both. left rear is easily out 9/16”. We don't have public addresses. Scan the image and upload it to a hosting site like Photobucket and they will supply a link to post here to make it show up. One Of Those Bad Boys Should Work!